Relax at Leigh is a two storey 3 bedroom Leigh bach/holiday house . 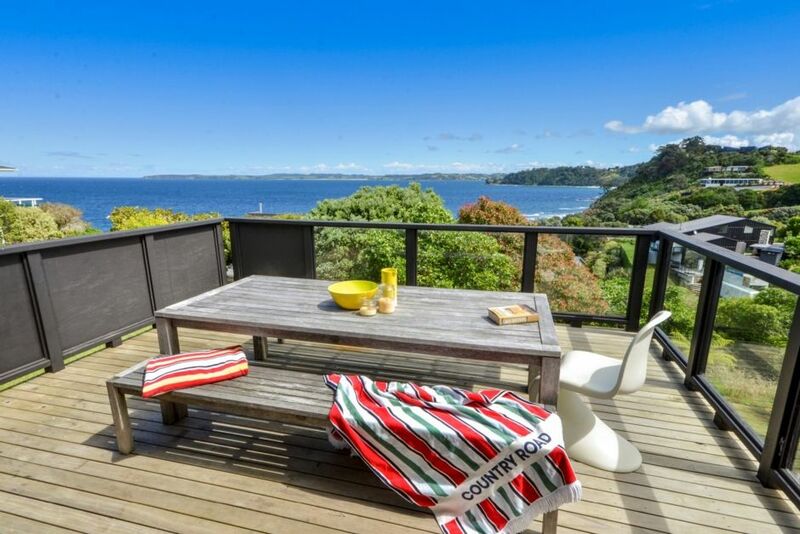 With expansive sea views, this modern beach base is an ideal option for a Matakana Coast hideaway! This Leigh bach/holiday house includes easy care and open plan living... Enjoy gorgeous views out to the ocean from every room in the house, or make the most of the coastline scenery from the upstairs deck and BBQ area - perfect for summer entertaining! Bedroom 1 at this Leigh accommodation is fitted with a Super King bed, bedroom 2 has a Queen bed and a King Single bed with pop-up Trundler ( can be used as 2 x single beds or made into a Queen size bed), while Bedroom 3 has 2 x single beds - this is a great option for families and groups of friends! When you are not unwinding on the decks, stroll down to Daniels Reef to check out the surf, visit Matheson's Bay for a swim or set out on adventure with plenty of beautiful locations to visit nearby - Goat Island Marine Reserve is a 5 minute drive, Parkiri Beach is a 20 minute drive, Omaha/Point Wells and Matakana are all within an easy 15 minutes. Matakana Coast Attractions include - Parkiri Horse Riding, Goat Island Marine Discovery Centre, Leigh Harbour and Ti Point Coastal Walkways, Leigh Sawmill Cafe, Leigh Eats, Ti Point Reptile Park, Vivian Gallery, Sawmill Brewery and Smoko Room, Matakana Country Park, Scupltureum, Matakana Cinema and Markets, Brick Bay Sculpture Walk plus many amazing vineyards and restaurants! Your beach getaway awaits, head to Matakana coast and Relax at Leigh! No large parties under any circumstance. Great family place to stay - really well-equipped bach with awesome ocean views. Great family place to stay - really well-equipped bach with awesome ocean views. Owner very responsive and easy to deal with - thanks so much! The house is amazing, everything has been thought of and is really well equiped. The house is amazing, everything has been thought of and is really well equiped. Its got a breath taking view and is the perfect place to have a relaxing time. The deck gets sun all day and it feels as if the house has just been freshly renovated, it was very clean. I would highly recommend staying here, it would be a great house if you had kids as well as there is a big yard.